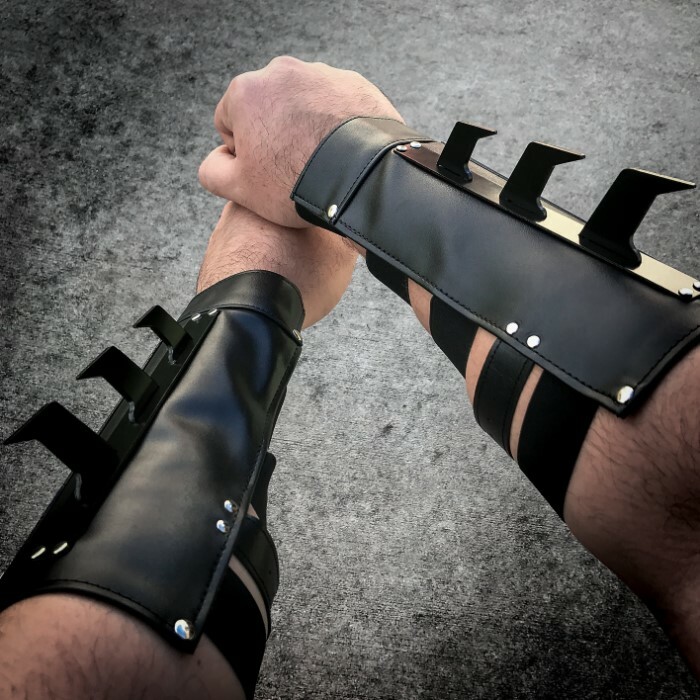 This quality faux leather bracer (a variant of the vambrace) is adorned with black metal spikes and protective steel plates. One size fits all, this item uses elastic bands to conform to your arm, while a belt buckle secures the bracer tightly in place. Includes oversized elastic bands which can be adjusted for the perfect fit! Can be worn over clothing and jackets (costumes), or overlap and connect the bands to make a tighter fit over just skin. 9 5/8 in. overall. Each steel plate is 7 in. long. This product offer includes two bracers -- One right handed and one left handed model. The bracers definitely look good and feel comfortable enough. Their main flaw is not having a better way of securing them to your arm. But that can be remedied with improvised straps. All in all for the price a great buy. I think they're OK. metal on the blades is strong but not sharp, so I think that they should be able to strap securely to their your arm,other wise they are great. I decided to get these after seeing Batman Begins. After all that ninja stuff with bracers, I HAD to have a set for sparring. I had read the other reviews about the straps being too big, But I figured it would be all right. I wish I had listened. Sure enough, the straps were MUCH too large. Another thing I would have changed is that I would have put two straps with buckles in, not just one. There are five straps, one with an adjustable buckle, and the rest are elastic. I think it needs another buckle. However, I just wore a thick sweater, and then put them on, and they worked reasonably well (except you get hot in Texas wearing a thick sweater-whew!). You should see the damage the spikes did to my brother's sparring sword! Another thing: Those spikes are so sharp, you wouldn't believe it! If you caught somebody's skin, they would do a LOT of damage. 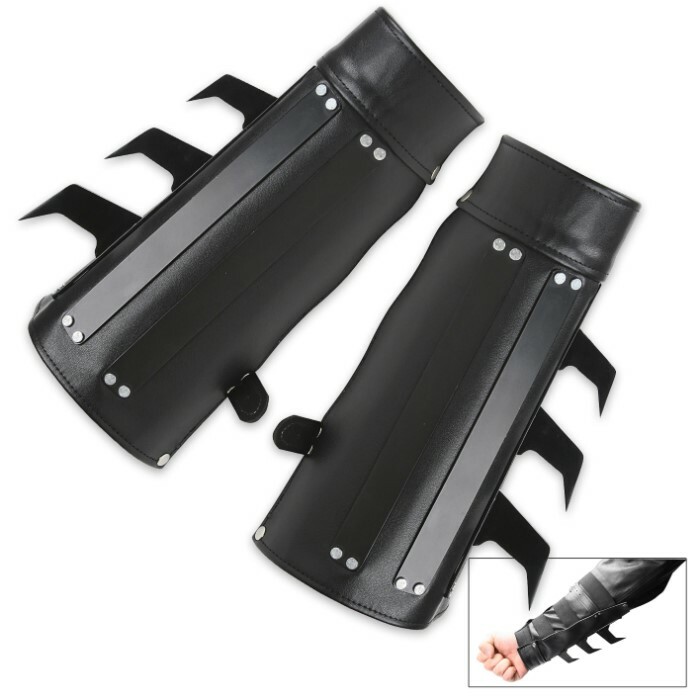 So, if you have big arms (I have pretty small arms, by the way), these should work fine. They would also work well for a Batman costume, because they look great, and you'll probably be wearing long sleeves anyway. I was honestly surprised when I got these. I was thinking I was going to get something that looked really good but not something that could be used. I wouldn't recommend using them, but they could be. I was also surpised that the fins on them were made of metal. Which could show them being used to protect against sword strikes. The only thing I could see as wrong with these are the buckle and tighting strap both look really cheap and easily breakable as well as hanging out where they can be seen easily. All in all I was happily surprised with this purchase and would recommend them to anyone, a fan of the movies or not. fits nicely. well worth the the money. batman fans would love these or just ninja fans. a little disappointed with this one. the spikes and plates are fine, but the fitting is not good. they are way to big for my arms and I have average-above average sized arms. the underneath part is stretchy but it's just too loose. it should be smaller so that it can fit normal sized people and stretch to fit bigger people. Looks really cool. Very Batman feel to it. The only draw back is that you have to wear long sleeves with them. otherwise your arm will be skinned. but it's a small price I suppose. blades arent sharpened. but still pretty cool.